“That’s why we can have nice things,” City Librarian Irene McDermott said wryly, explaining what exactly makes the San Marino library, well, a San Marino library. McDermott knows the area exceedingly well. She has been the city librarian for six years, but her overall tenure in San Marino began before Crowell was built; her start day at the then-San Marino Public Library was 21 years ago. Her resume at that point was a 17-month hitch at USC’s library, which began after she earned her master’s degree in library science from UCLA. Since then, the Pasadena resident has enjoyed her bridge into San Marino’s intellectual and recreational side. The publication Library Journal has noticed. Crowell routinely ranks in the highest percentiles of libraries of its class (those with an annual budget between $1 million and $5 million; Crowell’s is around $1.5 million), most recently ranking in the top 5.9% of such libraries nationwide and in California’s top 10. The evaluations pointing to these rankings are based on staff size, material circulation and programming, among other factors. So, what does a library in a town like San Marino look like, exactly? Demographics matter, McDermott added; the 2010 Census indicated that about 53% of San Marino’s residents had a Chinese or Taiwanese background, and many are immigrants. Volunteer Jenny Chu helps to accommodate them, traveling to Taiwan annually and returning with around $2,500 worth of new books, as well as leading a Mandarin-English bilingual story time. The library maintains the traffic to justify the investment into it. For the 2017-18 fiscal year, it had 32,834 registered borrowers who contributed to a total circulation of 240,695 materials. There were 245,761 visits to the library that fiscal year, an average of just fewer than 700 a day. The Crain Art Gallery, named in honor of former librarian Carolyn Crain after she died in 2008, regularly exhibits local artists’ work. The facility is open for 62 hours each week. There were 444 programs conducted, and they experienced an average attendance of 28 people. Many of the programs were presented by outside organizations working with the library, including the San Marino Historical Society, USC, the United Charity Foundation, Los Angeles Opera, Huntington Hospital, the Braille Institute of Los Angeles, the Pasadena Tournament of Roses and the Pasadena Humane Society. The library’s 16 internet access computers averaged 14 users per hour, with an additional 15 users per hour making use of the Wi-Fi internet in the building. (That network is, as displayed, funded through a plethora of donations from residents) The total catalog of material exceeds 99,000 items. Of the 4,545 households in San Marino, 3,791 of them — 83% — had at least one occupant with a library card. More than $220,000 in passport fees were collected in the 2017-18 fiscal year. The Friends of the Library-run Friends Book Shoppe, which sells old donated books, adds around $60,000 in revenues each year. Another nonprofit, the San Marino Library Foundation, makes donations for capital projects and other endeavors, including the radio frequency identification system presently being installed. The San Marino Women’s Club also donated a large format printer and laminator for library use. 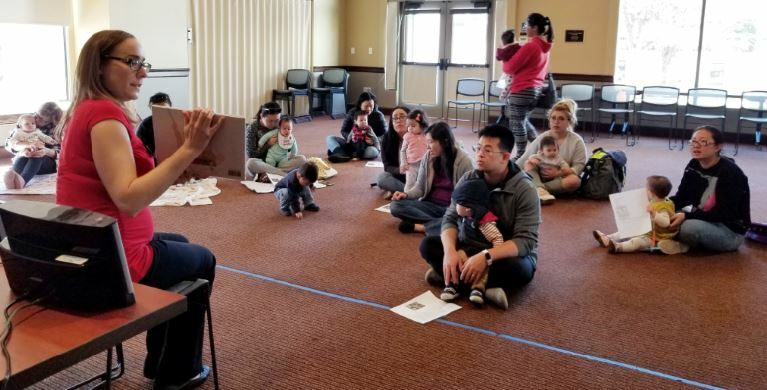 Crowell Public Library’s youth services librarian Tera Torres reads to parents and their children during a weekly story time the library hosts. Community-building events such as this have helped make the library part of the community’s “soul,” according to a longtime resident. The universal onset of the internet doesn’t minimize the use of libraries (which, of course, offer internet-access computers for free public use) or of librarians, who are, after all, trained to help people get on the right path to whatever they’re researching. “That’s the first rule of librarianship: People ask for something that they’re not looking for,” McDermott said. “With the internet, as you know, there are good-quality and poor-quality sites. In many cases, it’s wise to turn to a librarian for advice on quality web sources. 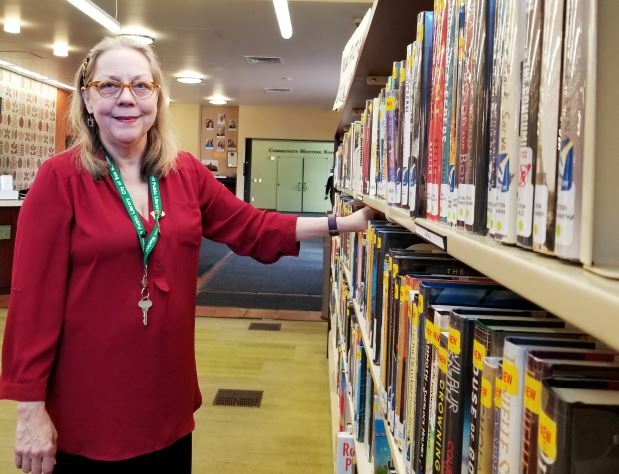 One of Crowell Public Library’s most fiery advocates is 45-year San Marino resident Louise Cook, who contributes peripherally to the library’s recreational activities as a member of San Marino’s Recreation Commission. Cook, in singing the institution’s praises, referenced again its ranking in Library Journal. Tera Torres, the youth services librarian, has been with Crowell for 11 years (“I came with the new building,” she quipped) after working in Monrovia and La Verne. She said the small-town nature of San Marino and the generosity of the community make her work that much easier. “I love how connected with the community we are,” she said. “It’s a very safe area. I hear horror stories from colleagues who work in bigger areas, and I’m glad we don’t have these problems going on.